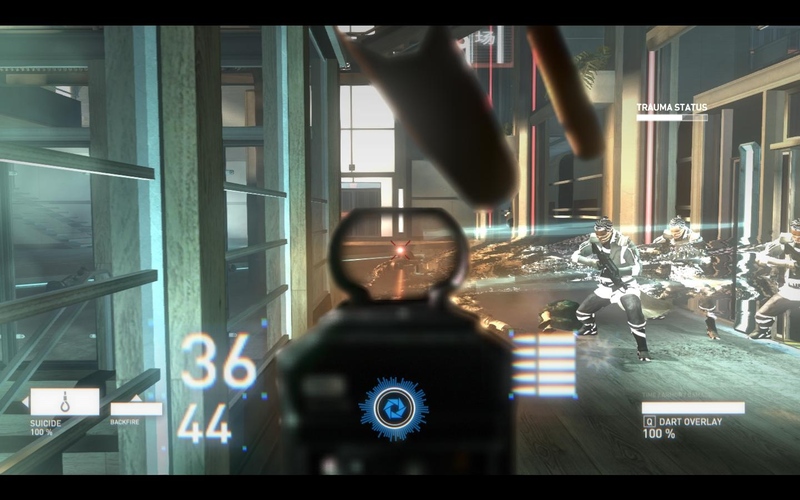 I’m not inherently against the basic concept of a Syndicate FPS. Its roots as an action strategy game mean it’s rather better equipped to leap that particular genre chasm than, say, the XCOM shooter; part of Syndicate has always been about the guns and the indiscriminate carnage, and so an FPS adaptation at least has something to work with there. Cybernetic upgrades allow for the quasi-RPG mechanics so beloved of today’s shooters, while the plentiful mission variety found in the original games would transfer across quite well and provide a decent base for the level design Syndicate Wars in particular also had a world rich with atmosphere and backstory which could definitely benefit a modern-day rendering of the concept. 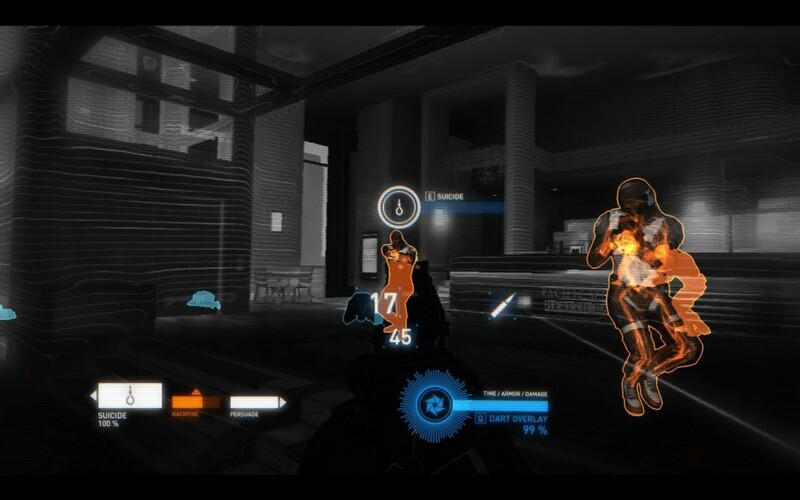 To its credit Syndicate does make at least some use of these elements and has sold me on the idea of a Syndicate FPS. 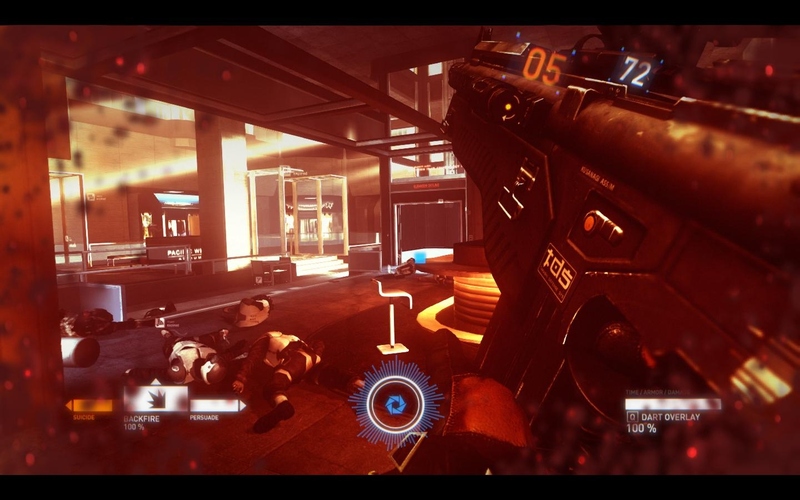 What it hasn’t done is sold me on the idea that this Syndicate FPS is a particularly good one. Now, to be fair to Syndicate I ended up liking it rather more than I was expecting to. I was expecting to hate the thing as it appeared to embody everything I loathe about AAA game development these days. So I was quite surprised to see that Syndicate ended up doing two things rather well indeed: it provides a terrifying glimpse into the future of augmented reality displays, and it also has one of the better implementations of player character presence in and interaction with the game world that I’ve seen in recent years. By that latter one I mean that in Syndicate you’re not just a disembodied eye floating two metres above the ground with a gun welded to the bottom of your vision; instead when you look down at the ground you’ll be able to see your body and feet, you’ll be able to bump into things realistically, you’ll be able to move around with a real sense of momentum (for the five seconds that the game will let you sprint for, anyway), and your character – a total cipher going by the name of Agent Miles Kilo – will even automatically switch gun hands when he’s trying to poke the thing out around the left side of a piece of cover. This is a key, key thing that most FPSes just flat out ignore in favour of having a static protagonist, and while I can understand that that’s much easier from a development and implementation point of view, having the protagonist be reactive to their environment as they are in Syndicate adds a great deal to player immersion. It’s kind of the whole point in using first-person perspective in the first place, and in terms of actually making you think you are there in the game world Syndicate does the best job I’ve seen since Mirror’s Edge. As far as that game world goes it’s kind of a mixed bag, though. Visually it hits all the right notes for a cyberpunk future; I can’t decide if Syndicate’s world seeming rather sterile and lifeless means that they failed somewhere in terms of their art design or if they succeeded beyond their wildest imaginings. My augmented reality comment earlier was a bit of a snipe, because while Syndicate’s UI is supposed to be one of those flashy futuristic things that’s chipped straight into your character’s visual cortex what it’s mainly used for is highlighting mundane things in the game world such as chairs and drinks machines and giving them helpful labels such as “chair” and “drinks machine”. At first I was aghast that they had included such a blindingly pointless and unhelpful feature in the game (mainly because it brings up a loading bar and you wait to see if it’s anything interesting and then it says “This is a chair”, resulting in a repeated waste of your time until you learn to ignore it) but then I realised that this is basically what Google Glass is going to do, making it not so much banal as it is depressingly accurate. This is actually what augmented reality vision is going to be used for in the future, and Syndicate just figures we should start on it a little earlier than we could otherwise. I guess it’s just a mercy it didn’t use it to inflict targeted advertising on the player character a la Minority Report. Anyway, aside from labelling things what Syndicate’s flashy futuristic cybernetic capabilities are used for, mostly, is pushing buttons at a distance; there’s a lot of puzzles in the game that amount to “push button to lower lift”, except they’re dressed up as “hack system on other side of lift shaft to lower lift”. I have to say I found this rather disappointing, since it’s a rather annoying thing about games which are set in the near-future and which feature extensive amounts of bio-augmentation that they don’t really explore the gameplay possibilities offered by bionic limbs and artificial skeletons. I’d have loved to play a game where I could buy upgrades that would make me run faster, jump higher and hit harder; the first two seem like they would have been particularly appropriate given the intense physicality of Syndicate’s world interaction. Instead you just get three active chip-hacking abilities which are functionally identical (make baddies kill themselves, make baddies kill each other and then themselves, and knock baddies over so that you can kill them with a single bullet) and a bunch of passive upgrades you can spend points on by periodically wrenching the chips out of your enemies’ heads. The passive upgrades are incredibly underwhelming and don’t do anything to move Syndicate away from being a basic run-and-gun shooter, while the active abilities are a bit better but end up being just another kind of weapon. There are occasional inventive uses of the chip UI during boss and special enemy encounters – I did like being able to quickly hack grenades that were thrown at me and then throwing them right back – but otherwise it’s startlingly unimaginative, like the developers were too scared to try pushing people out of their comfort zone with the possibilities the Syndicate IP provided. And that statement pretty much sums up Syndicate in a nutshell, really. Despite its superficial resemblance to Syndicate what’s under the hood is a depressingly conventional shooter where you progress down a linear path killing baddies while occasionally hammering F in a quicktime event. There’s boss fights (most of which were inoffensive enough, but there’s one which was eye-gougingly terrible and annoying and took me seven reloads to finish), there’s on-rails turret sections — there’s just about everything you would expect to find in an FPS these days, in fact, and I don’t mean that as a compliment. The core of the game is like somebody went down a checklist ticking off all the generic shooter features without any real thought as to whether the final product would be engaging or fun or how they would tie into the overall plot of the game (which is complete balls, since you ask). That Syndicate just about held my interest until the end was largely down to the good work that’s been done on basic enemy design; there’s baddies with armour that you have to briefly make vulnerable with your chip, baddies with jammers that shut down chip functions and who have to be targeted first, and (a great achievement) invisible baddies that are actually fun to fight, all of whom serve to spice things up and prevent things from devolving into enemy whack-a-mole. Sadly, for every good idea Syndicate has I can point to two bad ones that drag it back down into the mire of mediocrity that most shooters inhabit these days, and while I’d definitely rather play a Syndicate than a CoD or a Battlefield (single player), when all is said and done I’ll still lump it in the same box as those two because Syndicate doesn’t quite do enough to properly distinguish itself from them. A final word on Syndicate’s relationship to the overall Syndicate IP: does it make decent use of it? In certain areas, yes it does. There are points in the game – generally when you’re just about as far from a quicktime event as you can get – where you really do feel like this cybernetically-enhanced badass rampaging through a city in pursuit of a corporate goal. There was one particularly good bit close to the start where Miles drops down into a nightclub and has a running gun battle with enemy security forces while terrified civilians scramble for cover, making target identification difficult unless you choose to indiscriminately gun everyone down to make your job easier. That was Syndicate; it’s not about running down a corridor while bad guys pop out from behind cover like they’re in a target gallery, it’s about a peaceful city that’s unaware of your presence suddenly exploding into bloody violence as you try to complete your mission heedless of the collateral damage. The nightclub was what convinced me that a Syndicate FPS didn’t necessarily have to end badly, and that if structured and executed correctly it could have given the IP a new lease of life. 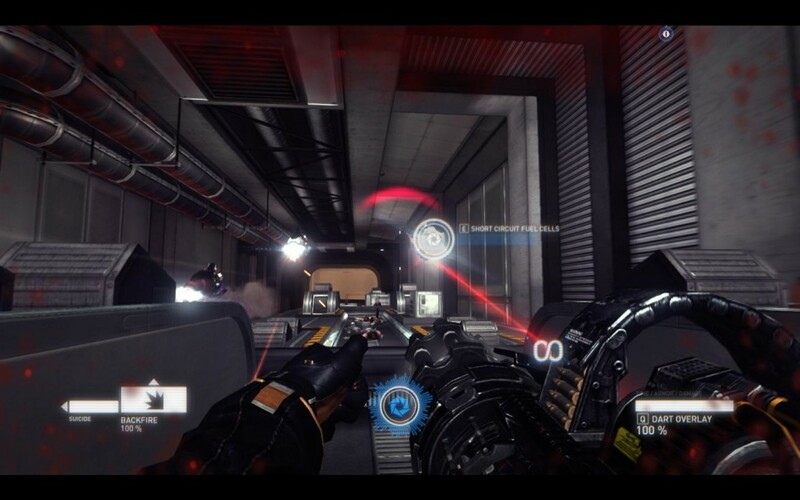 That Syndicate FPS is not this Syndicate FPS, though. Starbreeze did a better job with it than I expected, but it’s still nowhere near good enough. Part of the problem with genre-switching–I’d say the chief part–is that publishers too often slap an identical name on a very different product. As much as I hate to praise them, Ubisoft has the right idea with treating “Might and Magic” as a setting containing several different franchises. You can’t complain that Heroes of Might and Magic (excuse me, Might and Magic: Heroes) is different from Dark Messiah of Might and Magic, because they’ve addressed that. I’m also a big believer that companies need to embrace subtitles. Sequential numbering, besides being kind of ugly as part of a title, implies continuity. If I didn’t play Devil May Cry and Devil May Cry 2, will I be able to follow the plot of Devil May Cry 3*? I personally believe that Bethesda would have been better served if they had used the title Fallout: DC or something, allowing them to more easily sidestep some of the criticisms levied at Fallout 3 from franchise fans and freeing them from having to adhere to really anything that came before. *Answer: Yes, though they’re barely coherent to begin with and contradict one another, which is kind of amazing given how simple they are. Subtitles run the risk of making already unwieldy game titles unwieldier, especially when you start subtitling the subtitles (there was a game that did this recently but I’ve forgotten what it was, alas). They’re also inherently superior to numbers simply because the videogame industry is far more likely to spin something out beyond the length of a trilogy than any other entertainment medium. Personally I’d prefer it if they just took their cues from James Bond or something. That being said, the ability for a universe/franchise to adapt to different genres is going to very much depend on the universe in question. Might and Magic always struck me as a fairly generic fantasy setting that easily stretches to accommodate the different games that have been set in it. Something like XCOM or Civ on the other hand is so inherently bound up with what it is that there’s almost no scope for adapting it to something else. My personal favorite for subtitles is Vampire: The Masquerade: Bloodlines (fantastic game despite its flaws). I would consider James Bond (and really anything similar) to have implied subtitles. Plus, even if they were explicit, people naturally focus on the subtitle. Nobody ever refers to “The Elder Scrolls #: Subtitle,” but instead focus on the actual title of the game. In instances like that, the “full title” merely denotes the franchise, making it clear that other titles exist (which the audience might be interested in) without drawing undue attention to matters of continuity. On the flip side, I was just reading about how Bioware/EA are trying to emphasize that Dragon Age 3 isn’t a continuation of either of the preceding games. About now they’re probably wishing they had ditched the numerals. Every Elder Scrolls game has actually heavily changed setting between games. I was furious when Oblivion turned Imperial province into a generic medieval mash. The first one had a moderately sensible Origins subtitle (but then they ruined it all by going all Dragon Age: Origins: Awakening: Breakfast) and then sort of pointlessly called Dragon Age 2… 2. Could have probably tried better (with the whole thing). What would the subtitle for the second one even have been, though.Dragon Age: Boredom? Dragon Age: Ennui? Dragon Age: Anders?